¿QUÉ ES LA FERIA DEL LIBRO DE COCINA? WHAT IS THE PARIS COOKBOOK FAIR? The Paris Cookbook Fair is the world’s largest fair devoted to cookbooks and wine books. Based on a huge network of publishers from over 50 countries, the fair is balanced between trade and pleasure. Publishers, authors, photograhers, stylists, printers, distributors, booksellers negotiate projects. At the same time, books are promoted with constant cooking demos by the greatest celebrity chefs, and wine tastings at the international bar. During four days, the intense activity between publishers boosts the sector with a high number of foreign rights buyers and sellers. For the first edition in February 2010 , more than 3.500 professionals attended the fair and over 4.000 cookbooks were exhibited in the rights center. 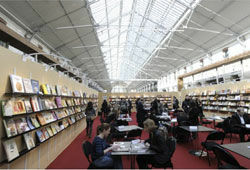 The focus on food and wine books makes the Paris Cookbook Fair easier for cookbook publishers and authors.There is time for real meetings, the decision makers of the sector are present, and results are there: many professionals closed more deals than at the other international book fairs. 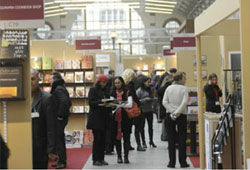 The results of the February 2010 Paris Cookbookfair show there is a strong intercontinental demand that is hungry for projects. One quarter of trade visitors came from outside Europe. At the same time it is the best place to meet the French, a big market for culinary books that is here for once easy to reach. This is Paris: culture, cuisine, fun, wine, elegance and glamour. 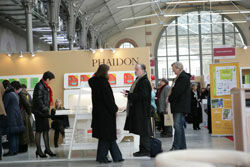 The trade activity at the stands is only one part of the Paris Cookbook Fair. The other is the presentation and international launches of books. 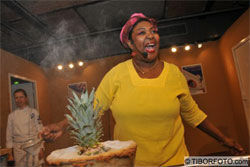 With non-stop cooking demonstrations, two show kitchens allow celebrity chefs and authors to present their cookbooks. Master classes, demonstrations, products presentations and press conferences are followed by numerous professionals, the public and media from all over the world. 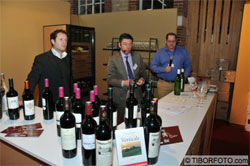 At the international bar, wine books are discussed with their authors and publishers while tasting wines and spirits from all over the world. Everybody works, tastes and enjoys in a very efficient, focused, relaxed and pleasant athmosphere. This is why trade results at the last fair were much beyond expectations for nearly all participants. ¿QUÉ ES LA FERIA DEL LIBRO DE COCINA DE PARÍS? La Feria del Libro de Cocina de París es el mayor evento del mundo dedicado a los libros de cocina y del vino. Cimentada sobre una vasta y sólida red de contactos de editoriales de más de 50 países, la feria aúna sin problemas negocio y placer. Editores, autores, fotógrafos, diseñadores, impresores, distribuidores, libreros; todos se juntan en la Feria del Libro de París para negociar sus proyectos. Además, demostraciones culinarias realizadas por los chefs de mayor prestigio y catas de vino en el Bar Internacional promocionan los libros más recientes. Durante cuatro días de intensa actividad, el elevado número de acuerdos entre vendedores y compradores de derechos dinamiza y fortalece un sector en pleno auge. En la primera edición de febrero de 2010, más de 3500 profesionales acudieron a la feria y más de 4000 libros de cocina fueron expuestos en el Centro de Derechos Internacional. La especialización de la que hace gala la feria –su particular sello distintivo– facilita el desarrollo de nuevos proyectos para editores y autores. Los principales pesos pesados del sector están presentes. Los resultados no se hacen esperar: muchos profesionales cerraron más tratos en la primera edición de la Feria del Libro de Cocina de París que en otras ferias internacionales de libros. Las conclusiones obtenidas tras la clausura de la feria en febrero de 2010 demuestran que existe una pujante demanda intercontinental ávida de nuevos proyectos. Un cuarto de los visitantes profesionales vinieron de fuera de Europa. Asimismo, es el lugar ideal para penetrar con todas las facilidades en un mercado francés más grande y fuerte que nunca. Esto es París: cultura, cocina, diversión, vino, elegancia y glamour. La actividad comercial de los stands es sólo una de las facetas de la Feria del Libro de Cocina de París. Otra de ellas es la presentación y lanzamiento de libros. Demostraciones culinarias non-stop amenizan la feria que, con sus dos platós de cocina, permite a autores y a chefs de prestigio presentar sus libros. Además, clases magistrales, demostraciones, presentaciones de productos y conferencias de prensa son seguidas con interés por numerosos profesionales, el público y los medios de comunicación internacionales. En el Bar Internacional, autores y editores amenizan las presentaciones de sus libros con degustaciones de vinos y licores de todo el mundo. Todos trabajan, degustan y disfrutan en una atmósfera relajada y placentera, sin dejar de lado la eficiencia y la profesionalidad. Esta es la razón por la que los resultados de la primera edición de la Feria del Libro de Cocina de París superaron con creces todas las expectativas. QUE SE PASSE-T-IL AU FESTIVAL DU LIVRE CULINAIRE? Pendant quatre jours, le Festival du livre culinaire réunit à Paris les plus grands chefs et éditeurs du monde entier. Quinze ans plus tard, il était temps de créer un salon pour augmenter les cessions de droits internationaux et ainsi favoriser les traductions. Désormais, Paris est au livre de cuisine ce que Francfort est à l’édition: le centre mondial des droits internationaux. Le Festival du livre culinaire répond à un problème global: certains pays ont tendance à se renfermer sur leur propre production, parfois par manque d’intérêt pour l’étranger, parfois par absence de contacts, parfois par surcharge de travail chez les éditeurs. Les principaux acteurs du secteur ont rencontré sur ce salon leurs homologues étrangers, avec notamment une intense activité des Chinois, des Italiens, des Russes, des Allemands et des Coréens. Ainsi, la quantité de traductions négociées lors de la première édition a dépassé toutes les prévisions, et les résultats commenceront à paraître en librairie dès Noël 2010. Cette bibliothèque d’Alexandrie du livre de cuisine regorge d’ouvrages sur tous les sujets imaginables par les gourmands du monde entier. La présence de leurs auteurs et des éditeurs permet aux curieux de mieux les découvrir. La première édition du Festival a créé une convivialité inoubliable entre chefs et amateurs. Au hasard des rencontres ou pendant les démonstrations, les visiteurs ont beaucoup dialogué avec les chefs, qui ont prodigué toute sorte de conseils et astuces dans une ambiance très amicale. Agnès Viénot Editions Publisher France www.agnesvienoteditions.fr guides, culinary photography, foreign cuisine, local cuisine, vegetarian, health and nutrition, culinary history, children and family, , professional. The World of Fine Wine Media & Publisher UK www.finewinemag.com The award-winning quarterly journal The World of Fine Wine is now in its fifth year of publication. This extraordinary publication is now taking the wine world by storm. It has an authoritative cast of writers—including Jancis Robinson MW, Michel Bettane, Michael Schuster, Tom Stevenson, Oz Clarke, Jamie Goode, David Schildknecht, Allen Meadows, Gerald Asher, Huon Hooke, Joel Payne, Serena Sutcliffe MW and Stephen Brook—contributing lively and original writing under the editorial baton of Neil Beckett, Andrew Jefford, and Hugh Johnson. Agnès Viénot Editions Editorial France www.agnesvienoteditions.fr guides, culinary photography, foreign cuisine, local cuisine, vegetarian, health and nutrition, culinary history, children and family, , professional. The World of Fine Wine Media & Editorial UK www.finewinemag.com The award-winning quarterly journal The World of Fine Wine is now in its fifth year of publication. This extraordinary publication is now taking the wine world by storm. It has an authoritative cast of writers—including Jancis Robinson MW, Michel Bettane, Michael Schuster, Tom Stevenson, Oz Clarke, Jamie Goode, David Schildknecht, Allen Meadows, Gerald Asher, Huon Hooke, Joel Payne, Serena Sutcliffe MW and Stephen Brook—contributing lively and original writing under the editorial baton of Neil Beckett, Andrew Jefford, and Hugh Johnson. Agnès Viénot Editions Éditeur France www.agnesvienoteditions.fr guides, culinary photography, foreign cuisine, local cuisine, vegetarian, health and nutrition, culinary history, children and family, , professional. The World of Fine Wine Presse UK www.finewinemag.com The award-winning quarterly journal The World of Fine Wine is now in its fifth year of publication. This extraordinary publication is now taking the wine world by storm. It has an authoritative cast of writers—including Jancis Robinson MW, Michel Bettane, Michael Schuster, Tom Stevenson, Oz Clarke, Jamie Goode, David Schildknecht, Allen Meadows, Gerald Asher, Huon Hooke, Joel Payne, Serena Sutcliffe MW and Stephen Brook—contributing lively and original writing under the editorial baton of Neil Beckett, Andrew Jefford, and Hugh Johnson. All tickets bought before December 2010 have an important discount. Buying a ticket before the fair helps to save time and avoids waiting lines. 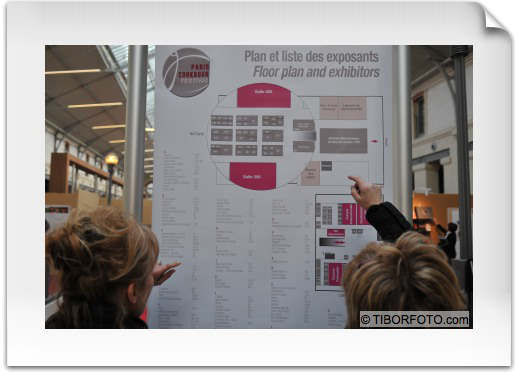 Access to the whole fair during one day (March 5 or 6), including the stands, the show kitchens, the international bar, the conference rooms, the exhibitions. Access to the whole fair during one day (March 3 or 4), including the stands, the rights center, the show kitchens, the international bar, the conference rooms, the exhibitions. Access to the whole fair during four days, including the stands, the rights center, the show kitchens, the international bar, the conference rooms, the exhibitions. Two four-day passes, access to the whole fair during four days, including the stands, the rights center, the show kitchens, the international bar, the conference rooms, the exhibitions. Two invitations to all the parties of the fair, including the cocktails after the Gourmand Awards Ceremony. The VIP-Professional is listed in the catalogue along with the stand exhibitors. The listing includes a short description of the activity, and the contact address. The catalogue is available to exhibitors and VIP Professionals in the months before the Paris Cookbook Fair in order to prepare meetings and networking. Please, fill in the form below to make your reservation. (*) Fields marked with asterisk are necessary. Please indicate the number of tickets you want to reserve. One-Day Pass (Public Days) units. One-Day Pass (Professional Days) units. (2 passes per unit) units. VENTA DE ENTRADAS. RESERVA INMEDIATA. Por favor, rellene el siguiente formulario para efectuar la reserva de entradas. (*) Los campos marcados con asterisco son necesarios. Por favor, indique el número y tipo de entradas que desea reservar. One-Day Pass (Public Days) uds. One-Day Pass (Professional Days) uds. (2 passes per unit) uds. Les entrées achetées avant le 1er Décembre 2010 bénéficient d’une remise considérable, et permettent d’éviter les files d’attente une fois sur place. Accès au festival pendant une journée (3 ou 4 Mars): accès aux stands, aux cuisines de démonstrations, au bar international, aux salles de conférences et aux expositions. Accès à la totalité du festival pendant une journée (3 ou 4 Mars): accès aux stands, au centre de droits, aux cuisines de démonstrations, au bar international, aux salles de conférences et aux expositions. Deux pass pour 4 jours, accès aux stands, au centre de droits, aux cuisines de démonstrations, au bar international, aux salles de conférences et aux expositions. Deux invitations pour toutes les soirées du salon, y compris les cocktails après la remise des Gourmand Awards. Le VIP-Professionnel est répertorié dans le catalogue avec les exposants. Le listing comporte une brève description de l’activité professionnelle et le contact de la personne ou de la société. Le catalogue est mis à disposition des exposants et des VIP-Professionnels dans les mois précédant le Festival du livre culinaire pour favoriser la préparation de rendez-vous. S'il vous plaît, remplissez le formulaire ci-dessous pour faire votre réservation. (*) Les champs marqués d'un astérisque sont nécessaires. S'il vous plaît indiquer le nombre de billets que vous souhaitez réserver. Pass pour 4 jours unités. (2 passes per unit) unités. En Vélib': paradas rue d’Aubervilliers, rue Curial, rue Riquet, avenue de Flandre, quai de la Seine y rue Tanger. Taxi - During the Paris Cookbook Fair we have our own taxi stop and dispatcher. En Vélib': bornes rue d’Aubervilliers, rue Curial, rue Riquet, avenue de Flandre, quai de la Seine et rue Tanger. Le Centquatre es un lugar de creación y producción artística único en el mundo. Sus 39, 000 m² acogerán a la Paris Cookbook Fair. Taxi – Dispondremos de una parada con servicio permanente. Vélib': (servicio municipal de alquiler de bicis) disponibles en la rue d’Aubervilliers, rue Curial, rue Riquet, avenue de Flandre, quai de la Seine y rue Tanger. Recomendamos la zona Louvre – Opera, cuya línea 7 de metro nos deja a menos de 10 minutos de la estación de Riquet, situada a 4 minutos andando de la Paris Cookbook Fair. Restaurante de Fabrice Lextrait, presidente de Les Grandes Tables. Abierto -sin interrupción- durante el horario de la feria, el restaurante ofrece almuerzos saludables y nutritivos. Sus ajustados precios permitirán disfrutar a todos de una comida diversa e imaginativa. 104 Café: Local contemporáneo inspirado en los ’50 que reúne tanto a clientes habituales como a artistas. El Café cuenta con una terraza con patio adoquinado y acceso directo a la rue d’Aubervilliers. Pizza Truck: El Pizza Truck situado en el Hall d’Aubervilliers ofrece pizzas, helados y dulces para llevar. Show Kitchens: Demostraciones ininterrumpidas ejecutadas por los mejores Celebrity Chefs. Bar Internacional: Profesionales del vino ofrecerán catas y presentaciones de libros en el bar internacional de la Paris Cookbook Fair. Le CENTQUATRE est un espace de création artistique et de production unique au monde. 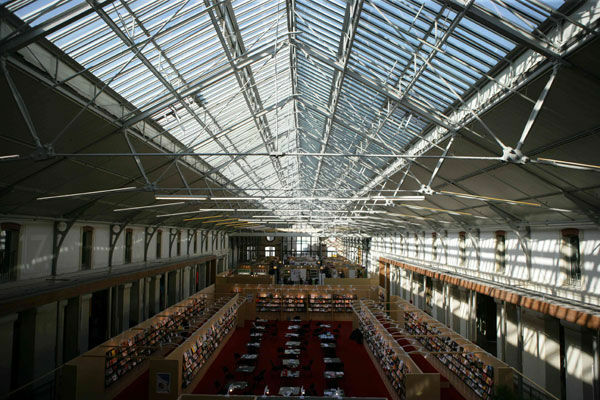 Cet espace de 39, 000 m² accueille le Festival du livre culinaire. Vélib': rue d’Aubervilliers, rue Curial, rue Riquet, avenue de Flandre, quai de la Seine et rue Tanger. Nous recommandons les quartiers du Louvre et de l’Opéra, metro ligne 7, accès direct en metro station Riquet (moins de 10 minutes) puis 4 minutes à pied jusqu’au Centquatre. Pour les budgets plus modesties: le quartier de la Bastille, à proximité de République. 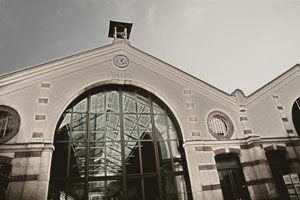 Les Grandes Tables du CENTQUATRE - Restaurant de Fabrice LextraiT: Ouvert du matin jusqu’au soir, le restaurant offre des opportunités de rafraichissements en dehors de l’heure des repas. Avec des prix délibérement raisonnables, il permettra aux visiteurs et exposants d’apprécier une cuisine ouverte sur le monde et inventive. Café 104: A la fois café pour les habitués et rendez-vous des artistes, dans un décor contemporain inspiré des années 50, il dispose d’une terrasse couverte dans une magnifique cour pavée, et un accès direct par la rue d’Aubervilliers. Le Camion à pizza: le camion à pizza offre une sélection de pizza à emporter, ainsi que des desserts et des glaces, il se situe dans la halle Aubervilliers. Cuisines de démonstration: démonstrations non stop par des chefs célébres. Bar International: Le Festival a un bar où des experts en vin présentent leurs ouvrages, accompagnés de dégustation. Eric Boschman, Author "Vins de Belgique"